Now that we’ve got everything installed and a new Cordova project created, let’s jump in and start building a real app! 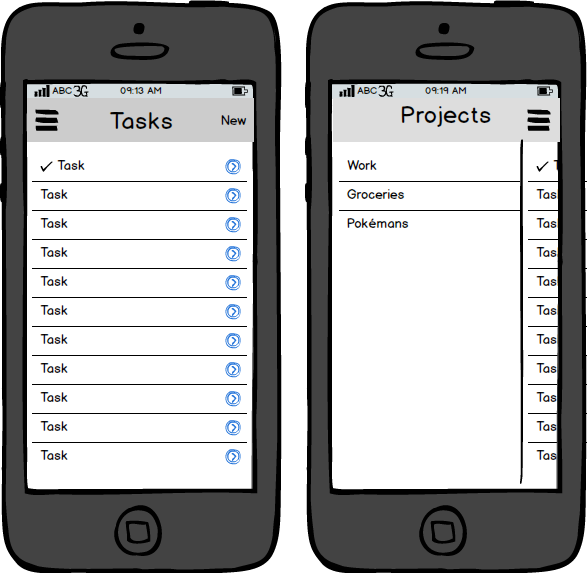 The Todo list app is pretty much a rite of passage for frameworks, so we will walk through the process of building one with Ionic. Also note that the cordova.js or phonegap.js file must be the last script, and that this file will not be found in your development files, but rather automatically included when running or emulating your app. Now that we have our starting place, we need to figure out what the UI of the app will look like. We have a ton of choices when it comes to UI design on mobile. There are a few standard layouts, like tabs and side menus, but there are practically infinite custom layouts that we could implement if we really wanted to (which Ionic encourages!). For the sake of this example, we are going to pick a simple Side Menu layout which lets us drag and expose a side menu with center content. In the code above, we’ve added our <ion-side-menus> controller which will handle the dragging and exposing of the side menu. Inside of the controller we have a <ion-side-menu-content> which is the center content area of the app, and a <ion-side-menu side="left"> which is a left, initially hidden, side menu. Now, if you run this code (more on testing in a bit), you wouldn’t see anything! There are two reasons for that: We haven’t created an AngularJS app to turn the custom tags (like <ion-side-menus>) into anything functional, and we don’t have any content yet! This is the Angular way of creating an application, and we are telling angular to include the ionic module which includes all of the Ionic code which will process the tags above and make our app come to life. This includes the script we just created. Now, we still won’t see anything if we run the code, because we need to add some content to the application. Let’s go ahead and add a header for both the center content area and the left menu. With our shell and app ready to run, let’s test it out and see how it looks!